I remember as a child looking forward to going to the Muny each summer in Forest Park. Children like routine, and each seven-show season with Grandma Dorothy, my mother and my sister was just that: dependable. Whether we were strolling through the gardens of the newly renovated Pagoda Circle, eating dinner beside the Cascades, driving past the lit-up Emerson Grand Basin fountains or walking beneath towering cottonwood trees, Forest Park was always a place where I felt at home; it was a place where people and nature met together in harmony. But as time goes by, we become adults — we experience the death of loved ones, birth and new life, and we travel away from where we grew up. We begin to realize how unpredictable life truly is, and how special familiar places like Forest Park are to us. In search of work in the field of horticulture, which I love, I found myself fresh out of college at age 22 on a journey out of St. Louis, to Rolla, Missouri, working as a horticulturalist for the University of Missouri Extension, and from there to a land of towering loblolly pines, Raleigh, North Carolina. Last year, Pender Nursery in Garner, North Carolina, welcomed me into their family as I worked during the spring as a salesman selling a diversity of trees, shrubs and perennials to local landscape companies from their 60+-acre container plant nursery. Pender Nursery is noted for its diversity of plant material, and I soon developed a good knowledge of hundreds of plants. I practically dreamed every night of Gardenia japonica ‘August Beauty’; Ilex ‘Golden Helleri’; Loropetalum Purple Pixie™ Rosa x Double Red Knockout™, Lagerstroemia; and, last but certainly not least, the ever-beautiful Southern favorite Encore® Azaleas. After a vigorous order season, I gained the North Carolina Certified Plant Professional certification from the North Carolina Nursery and Landscape Association. I thought for sure that I had been called to the East Coast for good, to begin my career in the field of horticulture. But fate would not have me stay. I still longed to work in public horticulture, so that once again I could use my knowledge of perennials and annuals to create colorful dynamic gardens for all of the public to enjoy. That July I applied for the position of horticulturalist with Forest Park Forever. After three excursions to a parking lot of the local supermarket for lunch-hour phone interviews, and a weekend flight home to St. Louis the first week of August for an in-person interview, I landed the job. This was an unexpected twist of fate — it was Forest Park, and the memories I shared within its bounds, that brought me home to a city, family and friends that I love. The Land Management team of Forest Park Forever manages 500+ acres of Park grounds in a ‘zone’ system, with our staff dedicated to seven specific areas throughout the Park. There are many benefits to this system, including that the horticulturists and gardeners are able to make and see through long-term plans for areas they really take horticultural ownership of. When I joined the staff in August 2014 and was told that I would manage the Grand Basin Zone, I was ecstatic. Beyond the marquee destination in the zone’s name, this area contains one of my favorite sections of the Park: the pedestrian path that runs from Lagoon Drive to the Boathouse. This path meanders past riffles, a rock-strewn runoff from the Grand Basin and Post-Dispatch Lake into the flowing stream. In the fall this area is particularly breathtaking, with the sounds of the cascading water, the brilliant red of the black gum (Nyssa slyvatica) trees, the violet hues of the beautyberry (Callicarpa dichotoma) fruit and the warm golden tan-brown of switch grass (Panicum virgatum) swaying in the late autumn’s setting sun. Migratory and wintering waterfowl such as hooded merganser, canvasback, red-head and ring-neck ducks, are a beautiful common sight in Post-Dispatch Lake. Photograph by Patrick Greenwald. 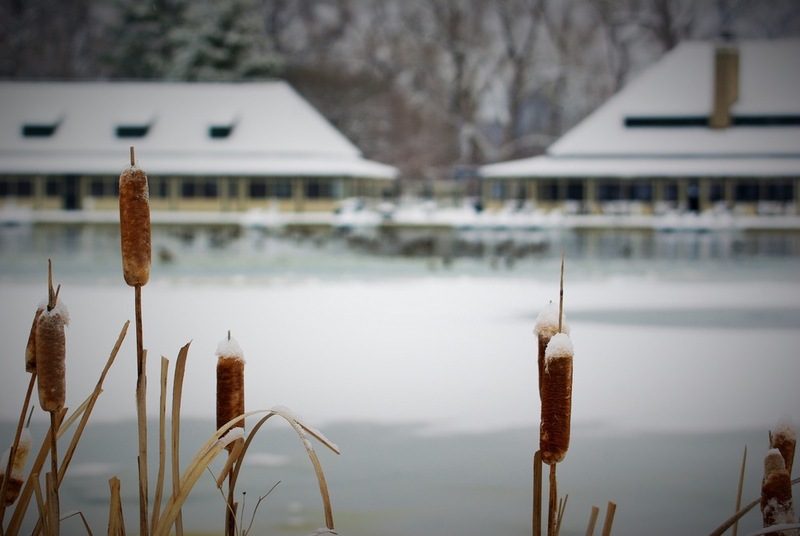 The Boathouse in winter. Photograph by Patrick Greenwald. As the horticulturalist for the Grand Basin Zone, I have been so eager for spring to finally arrive. Spring is a time for planting, and there are surprises in store for visitors to the annual flower beds located in front of the Boathouse restaurant. This April, the tulip display of over 11,000 red- and yellow-cubed tulips, and a scattering of the show-stopping Crown Imperial (Fritalaria imperialis ‘Luetea’) will light up the annual beds. More than 45,000 bulbs were planted throughout Forest Park last fall. We St. Louisans are fortunate to have, right here in our ‘backyard,’ a glimpse of the displays of the Netherlands (historically, home to extensive fields of tulips and display gardens). One of my fondest memories so far working in Forest Park has been planting our tulip and pansy display garden near the Boathouse. It was a team effort to plant 11,000 tulips and 2,400+ pansies this past fall. But through the help of volunteers, we got it accomplished. The harsh fluctuating temperatures, steady wind and bright sunny days this winter were a bit too harsh for our Panola XP Rose Picotee pansies, I am afraid, and we were able to enjoy their maroon-colored blooms for only a few weeks in November. This is all part of gardening in the Missouri climate. On the positive, one of our volunteers graciously provided us with 2,000 Spanish bluebell bulbs, which we planted around the trees along Government Drive. The river of blue blossoms should look wonderful in spring seasons to come. Besides ornamental and natural plantings, our zone is particularly vibrant with wildlife. Eric Hazley, Gardener for the Grand Basin Zone, will tell you that a pair of bald eagles, which he has named, has been visiting the Grand Basin and Post-Dispatch Lake for quite some time now. This December and January, we saw eagles in the Park nearly every day. Undisturbed by the people in the Park, massive birds often stare down at us as we make rounds pruning trees and shrubs within the zone. With all Forest Park has to offer, you too can enjoy its many natural wonders. Whether you are strolling by the Deer Lake Riffles and happen to see a great blue heron stealthily waiting along the banks, or a flock of egrets perched in a snag tree along Picnic Island’s shore, nature is alive and well in here. With more than 1,300 areas of natural habitats, recreation opportunities and cultural attractions, it is not hard to find yourself, as I do, at home in one of the largest and best urban parks in the country. It is truly a place where memories are made and where they last a lifetime. I am fortunate to work in a park everyday that holds so many great memories for me. Forest Park is reliable in the best sense of the word, for it is not stagnant at all, but ever-changing and improving with the restoration of the waterways and hardscapes, and the rehabilitation of natural areas, allowing more diverse plant species and wildlife to call the Park home. With the hard work of Forest Park Forever and the City’s Department of Parks, Recreation and Forestry, all of us can depend on the Park to be here for us to enjoy for generations to come, complete with sites and institutions that have stood the test of time in St. Louis.